Participants : Adrien Baranès [ correspondant ] , Pierre-Yves Oudeyer. The Exploration Explorer is a Matlab toolbox designed to allow the evaluation and systematic comparison of various intrinsically motivated exploration algorithms. It includes both a graphical interface for choosing the particular exploration algorithm among several possible ones, as well as the underlying low-level prediction systems, for tuning their parameters, and for choosing the sensorimotor space to be used for evaluation. Several algorithms are currently implemented, including different variants of the IAC algorithm  . 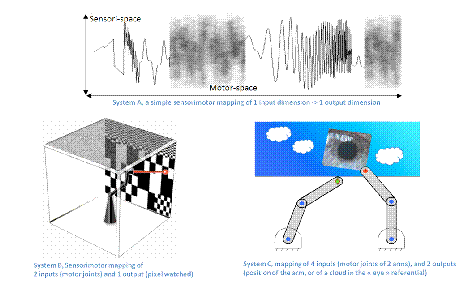 Several default sensorimotor spaces, together with their visualizations, are included (see Figure 2 ). The toolbox also includes modules to visualize both in realtime and as postprocessing the evolution of performances of each algorithm (see Figure 3 ). In the mid-term, this system aims to be distributed publicly as open source. Figure 3. Advanced visualization tools for monitoring the exploration algorithm properties are included in the toolbox.